Do not go to the Greek night at Oasis.. Not re-commended. Hotel is slightly out of town so if you can hire a car. Salt & Pepper at the end of the road is excellent for food. Although most of the restaurants are good. Highly recommend English breakfast at Jimmys as that kept us going most of the day. All rooms are clean and tidy. Food is great and breakfast is either full English with cereal and fruit juice, Greek breakfast or just toast and coffee. 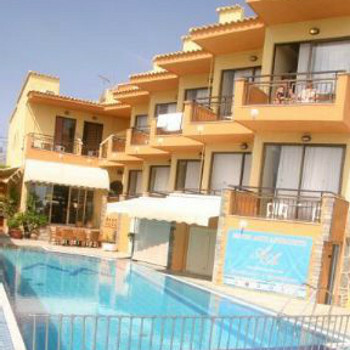 The swimming pool is large and spotless with plenty of sunbeds. Location is close to everything you need in Sidari. Nothing positive to say about this hotel. The pizza place round the corner is gorgeous. First time visiting Sidari, we felt the resort was clean. enjoyed the entertainment which was varied and the beach was very good, would definitly consider a return visit in the future. The resort of Sidari is small and rather like any other seaside resort with little shops selling the usual holiday tat we all buy and restaurants/bars etc. We found all the Greek people very friendly, genuinely warm and welcoming to us. all restaurants very clean,main strip was clean beach was cleaned regularly even saw litter being picked up by staff hiring sun loungers out.as for seaweed ,well it is a beach you cant expect anything else really and that was regularly cleaned from the beach.entertainment was there if you wanted some good tribute acts plenty of bars all in the one strip very noisy so be warned but your on holiday you dont have to spend every night there plenty of less noisy places near by.i wouldnt choose to return only because theres loads more places to visit in greece. Sidari is an excellent place for a holiday, you have the busy bar strip, or the quieter Canal D'Amour, the later being one of our favourite places to hit the beach and sunbath with lots of little sandy coves and stunning view that don't get too packed. The resort is very clean, all shop/bar owners clean the front pathways and road edge of their premises every day and their are no bags of rubbish left anywhere. The beach in sidari is very long, which each beach bar offering their own free sunbeds and cleaning their part of the beach, so it's just a case of finding one of the best areas, some are better than others. during our two week stay we saw Lady Gaga, Freddie Mercury, Elvis, Oasis, Cher, Take That, Micheal Buble, who are all really good, but the best two were Bob Marley and a tongue in cheek rock tribute band, who did a selection off all the greats, and they are all free! I highly recommend the mexican restaurant on the strip, we had a meal there and it was out of this world! Sidari is a lovely place the resort is pretty clean there is plenty to do, there is plenty of bars and tavernas which come alive at night. there is plenty of places to eat and drink Shakers, Fagins,Sea Breeze and Marias On The Beach do lovely food and they are lovely people who own them and the staff are very friendly and nothing is to much trouble for them. The beach is nice the best beach is Marias On The Beach or the Canal D' Amore. There is a lot of mosquitos in Sidari i advise to take a mosquito net and try skin so soft dry body oil the green one by avon spray it on at night i have used it for a few years now and i have never been bitten since using it it might not work for everyone, there is also a lot of wasp, bees and other insects in Sidari as i have a phobia with wasps & bees i noticed them more than any one else. I will visit Sidari again. Sidari has something for everyone, it really does, mainly mossies to be honest but there you go! If you’re eating out, try Pizza Romana behind the church which is delicious, and also The Magic Wok above BED if you fancy a Chinese. Other than that the restaurants are all much of a muchness with good food. The Greek night at Sea Breeze on Saturdays is not to be missed though! We hired a quad for a couple of days to get around and see the island and we came across some gorgeous taverna’s and bays but we both decided Sidari was probable the best of the bunch. If you get chance though, visit Agni Bay, we went to Taverna Agni which, although quite expensive, was stunning food, the bay itself is gorgeous too! The best night we had was the Bob Marley tribute act in Palazzo...superb night and a true entertainer! Best Self Catering Apartments in ALL of Greece! Fantastic hotel, but awful rooms.